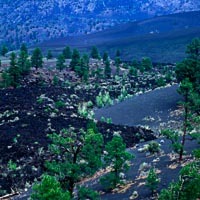 Bonita Lava Flow and volcanic cinders ejected from Sunset Crater volcano. 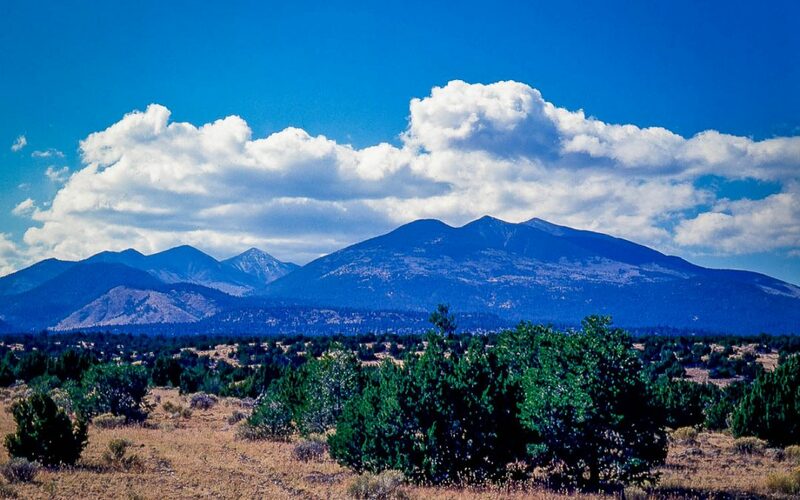 At the southern end near Flagstaff is a volcanic area dominated by the San Francisco Peaks, the highest point in Arizona at over 12,000 feet. The peaks are surrounded by cinder cones and lava flows. The dominant color here is black—black lava and black cinders and the dark green of ponderosa pines. All that darkness is offset by red pine tree bark and patches of cinders in rusty red colors. You can get close to one of the biggest of the volcanic formation by taking the loop road sixteen miles north of Flagstaff through Sunset Crater Volcano National Monument. Sunset Crater is the youngest volcano in the San Francisco Field erupting about 900 years ago. The road passes through the Bonita Lava Flow where magma oozed out at the base. The cone is 1,000 feet high and is crowned by red oxidized cinders that seem to glow at sunset and gave the peak its name. 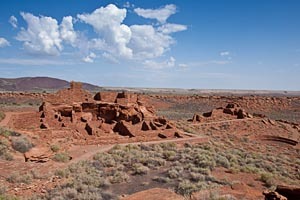 Also on this loop road off US Route 89 is Wupatki National Monument where the ruins of prehistoric Indian dwellings are open to visitors. These ancient buildings were occupied for about 100 years shortly after the formation of Sunset Crater. The ash from the volcano made the land more fertile by absorbing moisture and preventing evaporation. By 1180 thousands of people were farming this region. Their multistory buildings are still standing today as a testament to their excellence as stone masons. 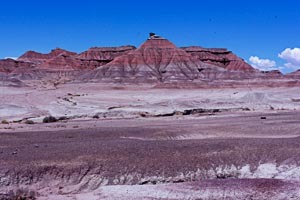 The middle part of US 89 between Page and Flagstaff passes through the Painted Desert on the Navajo Indian Reservation. Here you will marvel at the soft hills striped in white, red, brown and purple. It is hard to believe that this now dry land was once dominated by dinosaurs and giant trees as evidenced by logs of petrified wood. The highway reaches its low point at the Cameron Trading Post on the banks of the Little Colorado River. Cameron was established in 1911 when the bridge across the Little Colorado was completed. 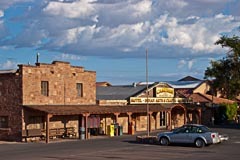 Today it is a popular stop for travelers and includes a large gift shop, restaurant and lodge. Be sure to visit the gallery in a separate historic building where you will find examples of fine Indian arts and crafts, both historic and contemporary. Also, tucked away in the back of the gift shop are a couple of display cases of “pawn”. You will feel like you’ve found a hidden treasure when you spy a very nice piece of jewelry at a reasonable price. Cameron is also the gateway town to the south rim of the Grand Canyon. Look for the intersection with Arizona Route 64 just south of town. It is a 30 minute drive to the east entrance of Grand Canyon National Park. Stop at one of the view points along the way to see the canyon of the Little Colorado River. 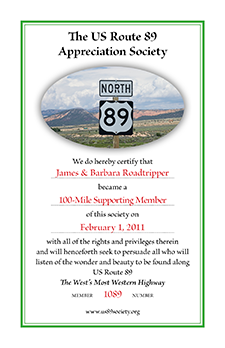 At the northern end, US 89 parallels the 800 foot high Echo Cliffs that gently guide you toward the Colorado River in Marble Canyon. 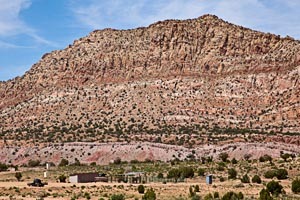 Here the dominant colors are the red and white strata of petrified sand dunes.. At Bitter Springs, US 89 continues north and switchbacks up the cliff face to a broad, high desert plateau leading to Lake Powell, a blue expanse of water from the Colorado River backed up behind Glen Canyon Dam. Alternate US 89 turns west toward Marble Canyon and the Vermilion Cliffs. 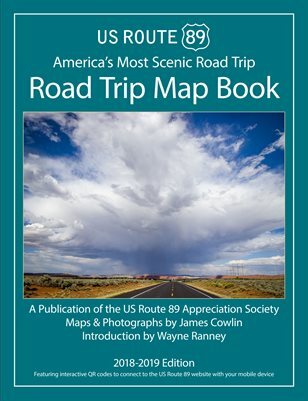 See the Guide to Driving US Route 89 and 89A for details of the two roads between Bitter Springs and Kanab, Utah. Does this affect getting from page to monument valley via 98 south to 160 north??? Should be no problem on 98 south from Page to 160, except the possibility of increased traffic because that is now the detour route around the collapsed section of US 89. 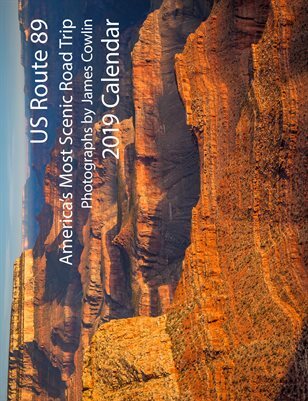 Finally heading west this summer..Phoenix-Grand Canyon-Zion-Bryce-then heading to MesaVerde etc..Have been receiving your emails for a couple years now–just ordered your book and am pretty excited.. Thanks for all your work.. Any tips would be appreciated..will be taking a lot of photos any tips with he bright sun being a factor?? The sun in the west always seems brighter. Clear air, higher elevations and the nearly naked land forms make for very saturated colors in photographs. My best advice is to check the histogram of your photographs a few times when you get started. Make sure that it is mostly centered and not bumping up against the right side which indicates over exposure. Once you get used to the light, a quick check on the LCD will reassure you that you are getting it right. 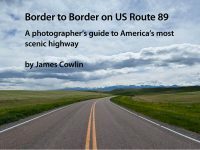 When you get home from your trip, you can add your stories and photographs to the Road Trip Guides on the US Route 89 website. Click on Share Your Stories to get started. Have a great trip.